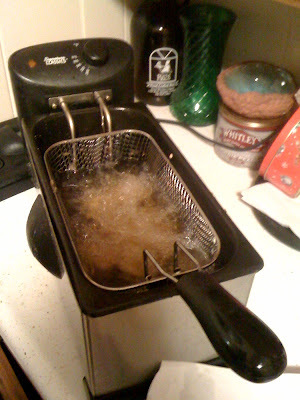 As a wedding present Jake and I got a deep fryer. I had never experienced the wonder that was a deep fryer prior to this gift. Now we deep fry okra, fries, chicken tenders... it is a bit ridiculous. Of course, we pace ourselves and try not to clog our arteries too much. It is just fun! I am a huge pickle fan. In fact, my two favorite foods are pickles and cheese (but not together..). They must be dill, however. And fried pickles? Well they are just amazing. 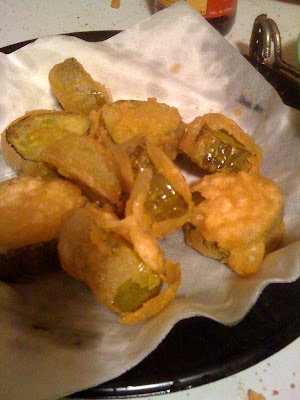 There are different kinds of fried pickles... beer battered, bread crumb bettered, flour/egg battered... and they all have different merits. 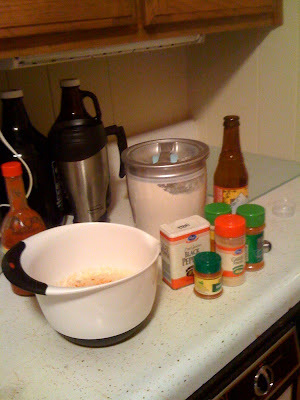 For a twist on our frying adventure, Jake and I tried out a recipe for beer battered fried pickles. Stir all but the pickles together in a bowl. Meanwhile, get your fryer hot to 375 degrees. ** The consistency of the batter is important because it needs to stick to the pickle - go for something sort of sticky mushy flour-y. 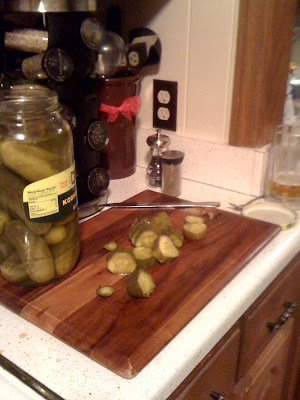 Slicing the pickles - we bought just regular ole dill pickles but for the true pickle fan, I recommend Claussen's pickles. They have a better taste. Dip them in the batter. Then, throw 'em in the fryer for about 4 minutes or until they float to the top: tip - we took them directly from the batter to the fryer so the batter wouldn't come off on a plate. The end result - home made fried pickles! We're still perfecting the art of not having the batter stick to the fryer basket. Not sure how to fix that. Serve with honey mustard, ranch, whatever your heart desires. You should deep fry OREOS, like at the Mid South Fair. Yummmy. That would ensure a long walk afterwards... Your house is looking great.